What sets context in great architecture versus standard buildings so I’ve been told is how the surrounding environment influences the design of the building. For instance if the building were to be set in a different location chances are it would look differently. If the building could be dropped anywhere and would have the same effect it’s perhaps not as good as it could be. Relating that environmental context I really thought that the new Apple Store posters in New York are pretty great. Ya the subway context is nothing new, but the thing is that this poster could not work in any other city. As a pattern when one poster is placed beside each other both horizontally and vertically it very attractive. It even feels natural to be on the walls that I saw it on today. This post is from DesignNotes by Michael Surtees. 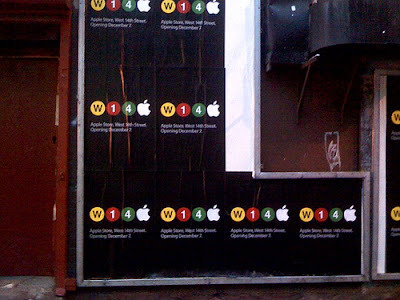 The new Apple store opens tonight from 6pm to midnight at West 14th Street (401 West 14th Street at 9th Avenue). You could win an iMac, a MacBook Pro, or an iPod touch.